My TiVo recently recorded a rerun of the PBS series America’s Test Kitchen called “A Modern Take on Pizza and Grilled Cheese” (#1404). I was already planning to bake some bread, and grilled cheese sounded like a nice alternative to the peanut-butter-and-jelly sandwiches I had been having rather too often lately. On TV, the recipe for “Grown-Up Grilled Cheese Sandwiches with Cheddar and Shallot” was presented by Bridget Lancaster; I knew that everything on the show appeared in Cook’s Illustrated magazine — usually the previous year — so I checked my back issues from 2013 and found the original writeup, by Lan Lam, in the September/October issue (p. 24). Their recipe calls for a “hearty white sandwich bread”; I had oatmeal-whole wheat sandwich bread, but I wasn’t going to let that stop me. The bread slices they used in the TV version were a bit larger than mine, which is not surprising (see my previous post), and the crumb a bit finer, but these are not supremely important differences. In order to make a grilled cheese that uses flavorful, aged cheese — in this case, a 12-month-old sharp cheddar — the first step is to make a fromage fort using the cheddar, a small amount of Brie (pâte only — no rind), and a couple tablespoons of white wine or (my choice) vermouth. Nowhere in the writeup or the TV episode do they actually use the words “fromage fort“, but if you’ve ever visited the cheese department at Whole Foods, it’s very often on display there (they make it to use up ends and small, less-saleable pieces of cheese). This is pretty easy to do in the food processor with all ingredients at room temperature. In addition to the usual ingredients, most of a minced shallot is also added to give some additional flavor. To punch up the toasted sides of the bread, they also make a compound butter with Dijon mustard — I left a few tablespoons of unsalted butter on the counter overnight so that it would be soft enough. The butter is applied to the outside of the sandwich, and the fromage fort is spread on the inside, then the whole thing is cooked on a preheated skillet until well browned on both sides. I’ve never been a huge fan of grilled cheese, at least not made the traditional way (with plastic “process cheese food” rather than actual cheese). This is one that I would happily make again. I have computed this exclusive of the bread, since the nutrition details for bread vary greatly from one recipe to another. You’ll want to use a fairly firm bread that can stand up to the heavy butter and cheese application without squishing down to nothing or disintegrating into crumbs, and then count that separately in your nutrition calculations. 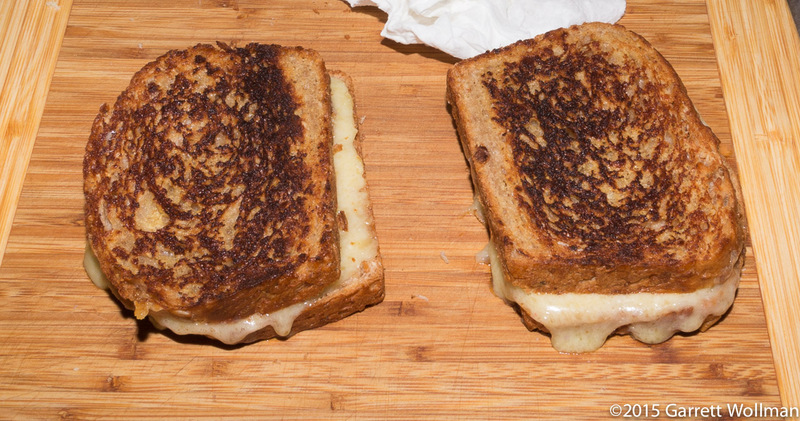 This entry was posted in Food and tagged America's Test Kitchen, Cook's Illustrated, grilled cheese, Lan Lam, recipe. Bookmark the permalink.